Places to see at Gopegarh: The forest on top of the fort has been slashed and replaced by flowers like Duranda, Vacaranda, as well as Tekosa, Shal and Bakul trees and strewn with soft lush green grass. The rail bridge over the sparkling waters of River Kasai is a sight worth watching, which you can, if you go on the top of another huge tower in this eco-park. Nearby attractions from Gopegarh: Among the nearby attractions, you can definitely visit the Arabari Forest Range which is the home to herds of elephants who often enter the forest from the Dalma range. You can also visit Gongoni, a naturally formed canyon located on the banks of the River Shilabati towards West Medinipur. Things to do in Gopegarh: Taking a stroll on the flowerbeds of this fort can be a nice pastime in Gopegarh. But mostly this place is to relax, rather than going around. How to reach Gopegarh: By roadways or railways, you have to first reach Midnapore. Leaving the city you have to continue towards the wild, which takes different look in accordance to the varying season. 3 km from there, you will reach Gopegarh Eco-park. 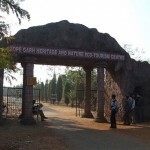 Best time to visit Gopegarh: This place is open round the year, but it is better if the rainy season is avoided for visiting Gopegarh. Lodging and dining facilities at Gopegarh: Forest bungalows and dormitories are the lodging options in this region, which are quite comfortable. These places are also equipped with good dining facilities. would be obliged if I am provided with some more details on gopegarh with regards to the travel if by road, the nearest railway station and modes of travel thereafter. Where to stay and the booking office address or contact numbers etc etc. Dear Anish, please drop your requirement through the contact pg form of the website.